Wolves beat Manchester United at Molineux for the second time in just 17 days on Tuesday night. The first victory knocked United out of the FA Cup while Tuesday’s victory knocked United’s hopes of a top-four finish in the Premier League this season. It also means that Wolves have beaten United twice in the same season for the first time since 1979/80. Let’s take a deeper look into this thrilling game. In the opening 20 minutes, Wolves looked like they had no chance. United were on it from the moment they kicked the ball out of the centre circle and almost scored after a mere 30 seconds. It was McTominay’s strike on the 13th minute that ended up opening the scoring, giving the impression that a thrashing was on the cards for Wolves. However, this wasn’t the case. After capitalising on an error from Fred, Wolves found themselves level and all of a sudden, the tables turned and Wolves went on to win. Overall, Wolves had 49% of the possession, nine shots, two on target, both of which ended up in the back of the net. 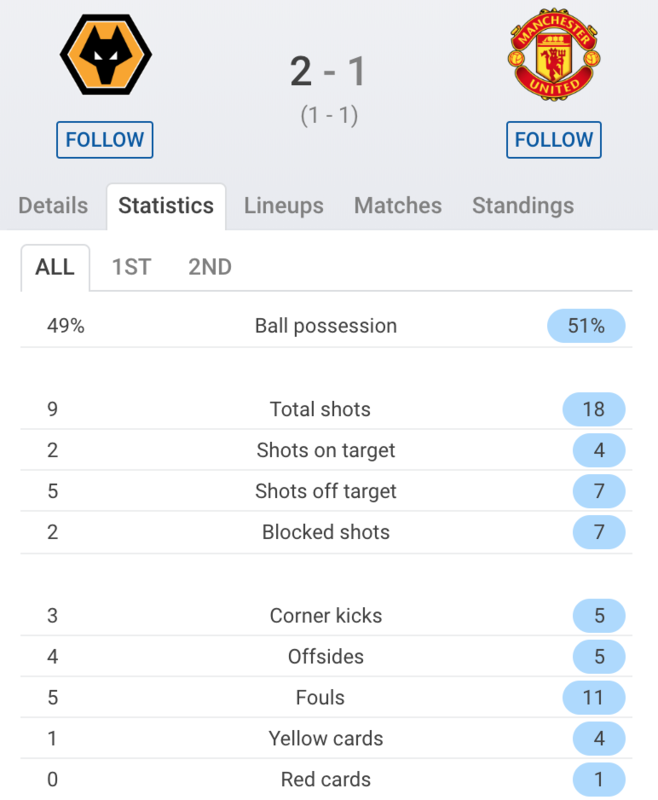 United, on the other hand, had a massive 18 shots only four of which were on target. After the first goal, Rui pulled off some fine goalkeeping to make sure none of those other shots went into the back of the net, and while United may have had more attempts, they didn’t make them count. Wolves showed great nerve and skill to pull themselves back from a goal down, and actually made a bit of history. Their victory meant that United lost for the first time in a match that they had opened the scoring since 2015. Lately, it seems that everyone is talking about Wolves’ hottest strike partnership of the century, Jota and Jiménez. The opening goal on Tuesday was a perfect example of just how well they work together and now that Raúl has joined the club permanently, there will hopefully be plenty more to come. Having both scored against United to put Wolves through to their first FA Cup semi-final since 1998, it would only be fitting that the pair would work together to begin the second beating of United in just 17 days. They read each other like an open book and it’s something that Wolves fans haven’t seen down at Molineux in a long time. Between them, they have racked up 19 goals and 11 assists so far this season, and that’s just in the league. They both had a great game on Tuesday but Raúl, in particular, was shining. He not only assisted Jota’s goal but had two shots blocked, one shot off target, made three key passes, created two big chances and played four out of five accurate long balls. Before the match, I was sceptical as to whether Wolves would be able to perform with a trip to Wembley looming, but they didn’t seem to have many problems on the night. They fought hard and gave themselves a massive confidence boost after their defeat to Burnley.